Parenting lesson #11: There will always be poop to clean up. When you have little children, it’s easy to daydream about being done with diapers and blow-outs and leaks and toilet training. But the truth is that even when you’re out of this phase, there will still be poop to clean up. Tuesday we had a snow day. Now, our Christmas break began December 19th, and that night Zach and Greg started flu symptoms. Eliza succumbed the following Monday. On Christmas, I still had three pretty flat-out family members and a rambunctious, healthy toddler. Then after another week of having three kids at home, I sent them off to school Monday and took a nice, long, deep breath. Thus, to have a snow day one day after school began again seemed so … unfair. As the snow piled up outside, three other people in this family who use toilets (read: not me) also managed to “pile up” some things. And they clogged two of our loos. I was sitting on the couch trying to appreciate being “all here,” when I heard Zach whine talking to himself in the bathroom. “I can’t use three pieces of toilet paper. It’s not enough and now mommy’s going to be so mad with me. I used too much toilet paper but I’m so sorry about it because I used more than three pieces.” I waited for him to emerge. And he gave me the saddest look and apologized for using too much toilet paper. I told him it was alright and ignored the bathroom because I wasn’t ready to deal with whatever had happened yet. Several hours later I had forgotten about it until I went in the bathroom and saw a toilet filled with half a roll of soaked tissue covering a brown mess that looked more like a bird’s nest than a branch. It was a scene that on this snow day, was all too familiar. And unfortunately for Zach, one I had witnessed one too many times (and the second stoppage of the day). 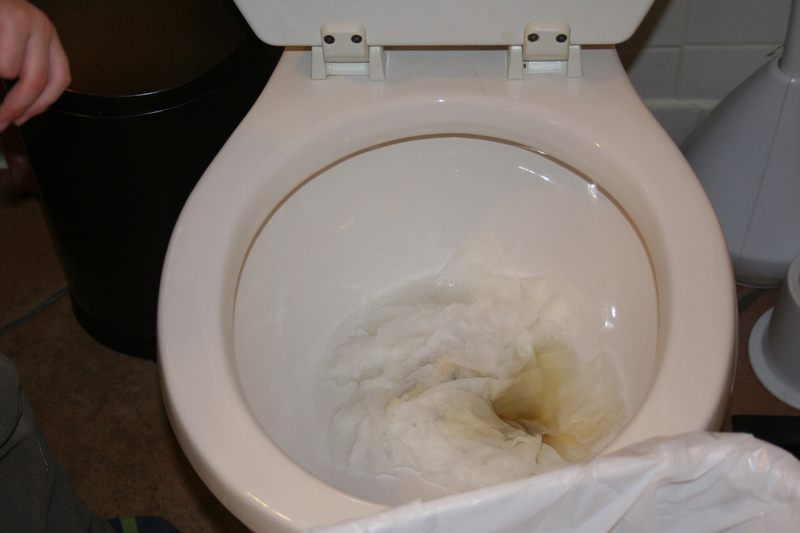 Can you see how much toilet paper is in the trash and how much is STILL in the toilet? 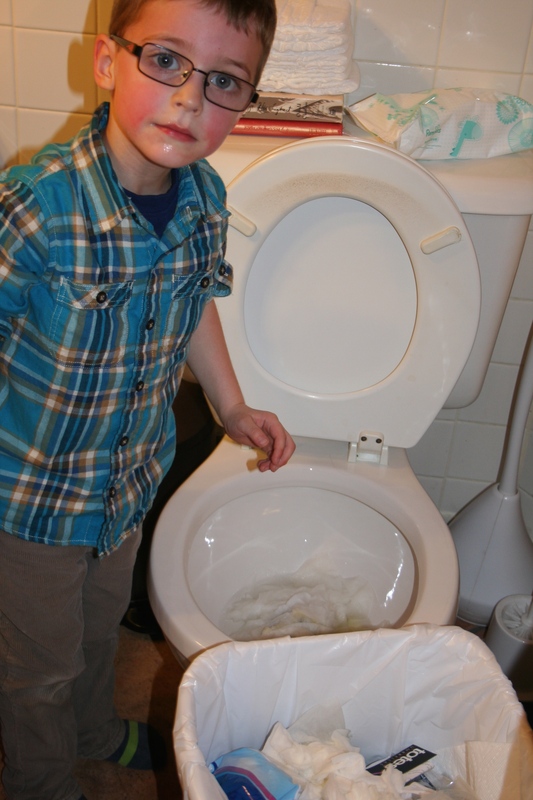 It’s been three days since the snow day toilet debacle, and so far, Zach has amazingly had zero issues in the bathroom. We will see if it sticks. But even if it does, I still won’t be done dealing with poop issues. Even once Ethan is out of diapers, toilet trained, and past using too much toilet paper, there will still be gross messes. They will come in the form of school issues and bullying and crushed dreams and dying friendships and break-ups and a hundred other things I can’t anticipate and don’t want to. So pull up your sleeves, grab your rubber gloves, and get ready to dig in. Because the poop of life takes many forms, and once you have kids, helping them deal with it never ends.